Potatoes aren't only for breakfast burritos. When looking to add a different texture or flavor to tacos, potatoes are a great addition. They are open palates for seasoning, and they cook up pretty quick. This recipes uses our Pastamore Fresh Jalapeno Oil that I find myself using often for both potatoes and Mexican cuisine. If the dish isn't spicy enough once it has been made, extra jalapeno oil can be added to a salsa or drizzled on top to up the heat. 1. Rinse the potatoes, and then chop them into 1/2" x 1/2" pieces. Add to the boiling water and par-cook the potatoes for 5-10 minutes. Remove from the water and drain in a colander. 2. Heat a large frying pan on the stove over medium/medium-high heat. Add the Pastamore Fresh Jalapeno oil, and, once the oil is warm, add the potatoes to the pan. Add the cumin, and season to taste with salt and black pepper. Cook until the potatoes are browned on the outside and tender inside. 3. While the potatoes are cooking, place a large frying pan on the stove over medium-high heat. Once the pan is hot, add the ground beef. Season with the oregano, paprika, and garlic powder. Cook until the ground beef reaches the desired doneness. Season to taste with salt and black pepper. 4. Heat the tortillas in a lightly oiled pan, turning over once during the process. I prefer to double up my corn tortillas so they do not fall apart. (This can be done during the cooking process so the tortillas are ready to go once the meat and potatoes are finished cooking). 5. 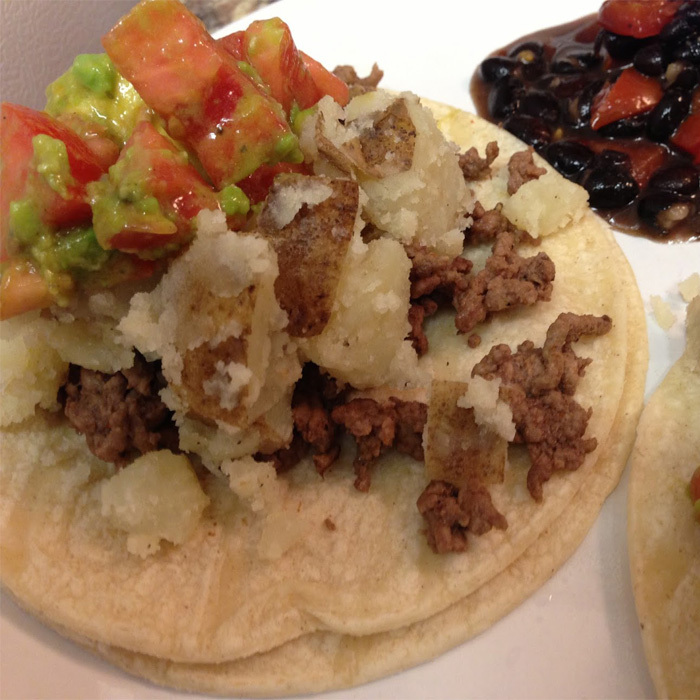 Place tortillas on the plate and top with a helping of ground beef. Add a large scoop of potatoes, and top with your favorite salsa.